Sometimes you just know when you've found the perfect person to share your life with but the time isn't right to ask her to marry you. Maybe you feel you're a little too young or, you both want to go to college first or, you just can't afford a wedding for a while. Your solution? Buy her a diamond promise ring and she'll know you're serious. Diamond promise rings stand for commitment and trust and most are affordable enough that they won't leave you broke and hungry. If you're lucky, she'll respond with a diamond promise ring of her own. As traditions go, the practice of exchanging diamond promise rings isn't particularly old; it took root only in the 1990s (traditions have to begin sometime, after all). Think of diamond promise rings as the modern equivalent of class rings and fraternity pins, the exchange of which began just a half-century earlier, in the 1940s and 1950s. Before then there were betrothal rings, but they evolved into modern engagement rings, which is a whole different subject altogether. 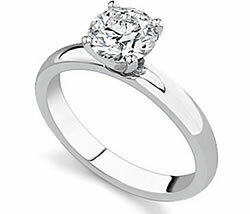 Ideally, diamond promise rings are meant to lead directly to engagement rings, and generally they do. Diamond promise rings come in a variety of styles (many of them available right here at Novori), crafted to fit a variety of budgets. The tendency, however, is to keep the price under $500. They usually differ from engagement rings by being smaller and made of more inexpensive metals, which puts most diamond promise rings within the price ranges of the younger people who are more likely to wear them. Often they take the form of a small diamond set in a yellow or white gold band; diamond chips are often used as accents. (Naturally there are diamond promise rings that are much more opulent, for the Donald Trumps among us). Heart-shaped settings and engraved names are common features, as are floral accents and the inclusion of semi-precious stones as well as diamonds. Though diamond promise rings usually represent a pre-engagement commitment, this isn't always the case. Sometimes they're used to symbolize religious purity: someone may wear a diamond promise ring to represent their devotion to a particular saint, or their promise of sexual purity until marriage. In the latter manifestation, they're often gifts from parents to their adolescent children. In some cases, they mean little more than the old school-ring exchanges of the past: they signify a monogamous relationship that may or may not proceed to engagement or marriage. Sometimes, diamond promise rings are even just friendly gifts -- friends, whether a boy and girl or two girls, exchange them without any expectation of a binding commitment. They may simply represent a secret kept, vows not to drink or smoke, or reminders of each other when separated. Admittedly, the aforementioned circumstances are rarer than the traditional reason for exchanging diamond promise rings. If this is the case with you, you're stuck with having to decide the right moment to offer up a diamond promise ring. Whenever there's a promise to be made is a good time, naturally enough, but they're particularly apropos on anniversaries of special events in your relationship: your first date, your first kiss, or the day you met. Graduations and birthdays are good too. Whatever you do, when you exchange diamond promise rings, be sure that you both understand the intention. It wouldn't do to give your girl a promise ring, and have her believe it to be an engagement ring. That road can lead to broken hearts for both of you.